If you are looking for an easy way to update the inside of your home, but you need to keep costs low, crown molding may be the best answer for you. 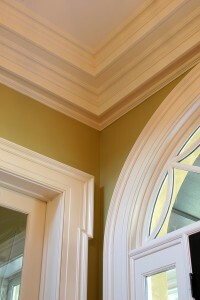 Crown molding is simple, elegant, and inexpensive. Adding a new coat of paint along with it is the perfect way to spruce up a room without much time or lots of resources. You can do a lot with crown molding. It can be simple and subtle, or it can be elaborately engraved with unique designs. It can look clean and humble or stately and exquisite. There is a type and style of crown molding that fits beautifully in every home. Some designs harken back to ancient Greek and Roman architecture. The styles that mark cathedrals and palaces can be added easily to accent the ceilings of your dining room or sitting room. Crown molding does not only have to go on the edges of ceilings. Placed thoughtfully, it can increase the depth and texture of a ceiling to make a room feel more intimate. It can separate wall areas horizontally for a two toned look or even a different material on the bottom half of the wall. Carefully spacing a few large rectangles of crown molding in the walls of a hallway brings attention and a sense of permanence to pictures and artwork. Anytime you want to draw eyes to a specific item or area in your home, crown molding is an easy way to emphasize an object or feature without distracting from it. To top it all off, not only is crown molding inexpensive, but it is incredibly easy to install. In fact, choosing the type you want, ordering it, and designing a layout may take more time than putting it up. A lot of crown molding comes ready to install and an entire project can be completed in one afternoon, especially with a trained professional on the job. Crown molding is a quick addition to update the the feel of your home inexpensively.